UO SLAP: Support a Tuition Freeze Not Fancy Parties! 50 University of Oregon students interrupted the Investiture of President Gottfredson demanding a tuition freeze last Thursday, May 30th. 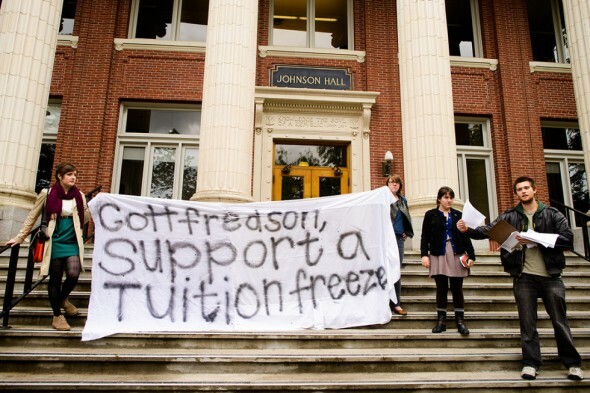 The Student Labor Action Project and our allies are pushing our University President and the Oregon University System for a tuition freeze and administration salary freezes. These demands are supported by campus unions, who with SLAP lead LESS-T (League of Educators and Students Slashing Tuition) to fight tuition increases that provide no additional resources for the students or teaching staff at the university. This year tuition is proposed to be raised 4.5% for resident students, with additional fees bringing the total increase to 5.8%. But the administration of our university has consistently demonstrated that they do not have good reason to raise our tuition. SLAP & LESS-T protested at the Matt Knight Arena for The President’s Investiture, a ceremonial welcome and symbolic exchange of authority to Michael R. Gottfredson. SLAP and other student groups on campus have been trying to meet with President Gottfredson throughout the year and were repeatedly told ‘no.’ So we came to him to demonstrate the seriousness of our concerns about tuition hikes. We did a mic check stating that we were not going to accept tuition increases because we were given little information or reason as to why it was increasing. Senator Ron Wyden and the Interim Oregon University System (OUS) Chancellor Melody Rose were also in attendance, and fortunate enough to hear our message that day. This action comes after multiple letters, meetings and visits, and hours of testimonials. Our experience has made us feel that the administration does not have the interests of students at heart. “We’re the ones getting a 4.5 percent tuition increase, and he’s the one getting a fancy party,” said UO SLAP President Jeremy Hedlund. We reached out to Gottfredson who has not responded to our requests for a meeting and who cancelled a scheduled meeting with campus workers from SEIU Local 503 once the delegation arrived to his office. We went to the Administration’s town hall with students (scheduled the week prior to Finals Week) about tuition increases/budget processes, where little was explained to us and we were talked to in a condescending tone. We have attended every town hall with legislators in Eugene voicing our concerns to elected officials. We had a call in day for students to call OUS representatives’ listed office number to give testimony about how they would be affected by tuition increases. We gathered over 300 petition signatures demanding a tuition freeze targeting OUS and presented them during testimony to OUS in Portland. The last action will be on June 21st at the Oregon University System’s board meeting where they will be voting on tuition increases for the coming school year. SLAP will be at that meeting with students from the UO to show that we are not going to accept tuition increases. Where will you be? where you can learn more about LESS-T’s work!! This entry was posted on Tuesday, June 4th, 2013 at 7:12 pm. It is filed under Featured. You can follow any responses to this entry through the RSS 2.0 feed.